This summer has really flown right by for me, has it for you too? It seems like just a few days ago we were looking forward to a full summer and now there is only one month left. August is always a busy month here. I need to can and dry peaches. We’re almost out of homemade dill pickles so those need to be done and I have to check on our bread and butter pickles too. We are working on painting our house, we need to replace three posts in our fence, and possibly pull up our old deck which is really more of a hazard than anything else. With the canning and our house projects that need to get done, it can feel a little overwhelming. But I know if I just take it one day at a time and work towards getting it all done, it will get done. And hopefully, before the rain arrives. Even though it’s going to be a busy month I’ll be working on my regular goals too. This month I’ll be working on 5 main areas. Homeschooling, Healthy Habits, Blog Growth, Family Time, and Using my Online Calendar. I’ve updated the progress I made on each goal as well as my plans for this month too. 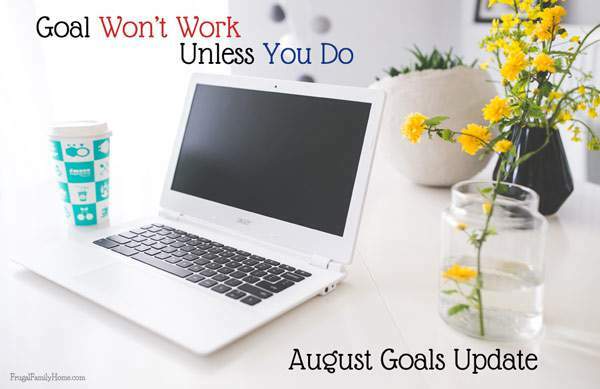 I would love to have you share in the comments below what your goals are for this month. We are continuing homeschooling over the summer. We do a limited amount of reading and math each day. Just to keep the skills current. We’ve also been doing a few fun science experiments. It’s not all book work that way. I was hoping this past month to get our pool set up, it didn’t happen. The weather was cooler than normal and wasn’t enough to keep the pool warm enough to enjoy it. But it’s been heating up a bit so maybe it will be warm enough to set it up this month. But the kids have been enjoying new water guns I purchased and having a good time playing outside. We’ve been getting our family time in each week. I decided half way through last month to bump up my exercising to 15 minutes 4 times a week and it has been going well. I also decided to change this goal from weight loss to healthy habits. I’m feeling more fit with the exercising I’m doing. I’ve also cut out evening snacking and no seconds at all for a while now. All of these changes are good to get me more healthy. I’ve decided to focus more on health changes than weight loss goals. After all making changes to be more healthy should equate to weight loss too. I’ll continue to work on exercising 4 times a week and keep my evening snacking limited. I’ve developed my plan for promoting the old and new post and I was able to stick with it during the month of July. I’m going to continue with this same plan into August too. I was able to write one guest post but haven’t submitted it yet. I’m hoping to get that done this month too. I’m still working on getting into the habit of using my online calendar. I’m still not loving it but I’m getting better. It’s a work in progress with me, so I’m keeping it on my goals for this month again. Those are my 5 main goals for this month. Most of these goals will go for 6-12 months, the organizing my time goal is just in the maintenance stage now until it becomes a true habit. I’ve been keeping on track with my goals using the steps I learned in the Make Over Your Year Course (affiliate link) It has really helped me to break down my goals into steps for each week and each month to reach my goals. So far it’s been going really well this year. If you need to set goals of your own I would definitely recommend Crystal’s Make Over Your Year course. (affiliate link) You don’t have to wait for the new year to start to make over your year, you can start today! 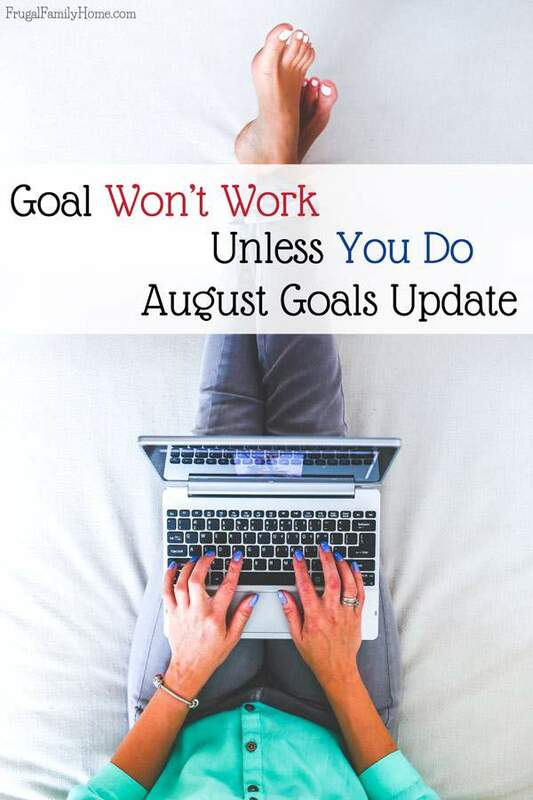 What goals are you working on for this month? I would love to have you share them in the comments below. This post contains a few affiliate links, which means when you purchase through them I may make a little money at no extra cost to you. Thanks for your support in this way! You can read my disclosure policy for more information. I know what you mean about feeling overwhelmed with house projects! We had a big tree fall down a few weeks ago and take out part of our fence. I hope the house painting goes well and that you are able to get your pool out soon!